Splitting the post is one of my favourites, if it works it gives great satisfaction when you are the post. It starts with a pass from 1 to 3. 1 and 2 will start a cutting move at the same time. As with the scissors timing is very important. 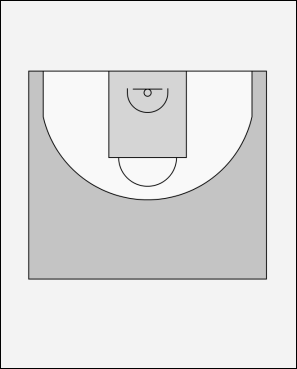 While protecting the ball 3 can make a pivot move to set a screen for 2 and 1. 1 and 2 split the post by cutting towards 3. If 1 or 2 can grab the ball out of the hands of 3 they should do so. The post however should not give a little hand off pass. Little control and quick defenders make this a not so smart move. In this case player 1 grabs the ball out of the hands of player 3. Makes a dribble and scores.